Purdy apparently had problems with their earlier poles (not surprising). They now have a new one that has a beefed up mechanism to release the pole for length adjustment. The nice this is that unlike many other designs, the pole can be set at any length - no little hole detents every so many inches. I like the idea of that. Brian will cringe, but I picked one up for about 20 bucks at the big Sale they're having. We shall see if it works. The price was right (which scares Me a bit). hmm I published that idea years ago. In fact it was a modified Wooster pole that had additional holes drilled in it. Only problem was the noise of the metal shavings that fell inside the pole when rolling. Kind of annoying. Does the frame lock to the pole? Its not clear on their website. The pole in the photo has a threaded end. I read a few reviews. It doesn't sound all that great. Besides its almost twice the weight of an FX4. 13.1 ounces vs. 25.6 for the Purdy 4 foot. OK, You're gonna laugh at this Brian, but I just went and grabbed My Pole (hadn't tried it yet) It does lock the extension down anywhere, nice and tight, and if extended all the way, the inner pole will not come out, however. the mechanism for releasing for adjustment is finicky; it's pretty hard to push down and will stick sometimes! And it is brand new!!! It has it's own proprietary means of locking to a Roller frame, but it would not work with a Wooster frame or any other than a Purdy I suppose. Purdy should focus on improving their brushes and forget about the sundries market. Their putty knives look horrible too. Me and SW/Purdy do not see eye to eye on anything. I am definitely not their customer. That company has been around forever, they should be nailing it on anything they pump out and they fail at it. There is no excuse for that coming from a company like Purdy. You'll like this one Mike. Reputation huh? That speaks nothing to me, but it is so accurate. There is that word (quality) again. Well you can make a high quality $100 brush, but how it performs doesn't have anything to do with quality materials or construction apparently. Brian, What pisses Me off is when companies like SW refuse to carry good products; many time far superior to their won, just because they happen to produce their own brand. I could see if their's was competitive or better, but it's not. Many times they don't even have a like product to offer and still don't carry it. 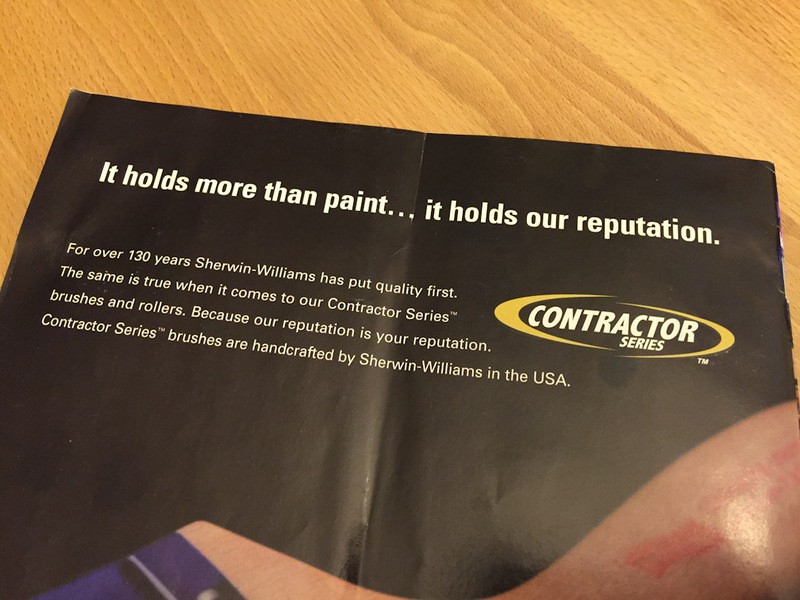 That is exactly what I mean when I say being part of the Sherwin Williams environment. Its a very different world when you step outside. Yea, it''s like the good ol' boys club. I got a comment from the moderator of another Painter's blog recently, after I addressed someone's post about the so-called poor quality of Proform brushes. He wrote Me back and said that he was glad I stood behind the products I sold. I wrote him back and said it was the exact opposite. I sell the products that I stand behind. If they didn't work, then I wouldn't have sold them in the first place. I actually told him that if he could find a better product for cutting than the Picasso or the Blaze, then Myself, Brian Havanas, and a lot of other guys would love to know about it. People just like hatin... People try to talk brushes with me and I be like blah blah blah nah to the I, to the I, to the no, no, no! This chic knows all about it. Poor girl. People think she's lip syncing. Oh you're better than me? I hate you then. Kind of childish really.